There are five major stage challenge types, each in its own column. All maps have a 30 second time limit, and there are only three arrows allowed at a given time. 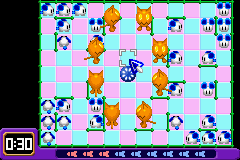 In addition to the normal levels, you can opt to play user-created levels, either created yourself or given by another player. A1 — Straight forward - Place left arrows to move the mice outside, and down arrows directly above the rockets. 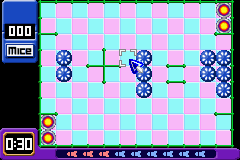 A2 — The difficulty is finding the path from the whole map to the rocket in the top left corner; while gaps in the walls are visible, the image to the left shows the route marked in red. 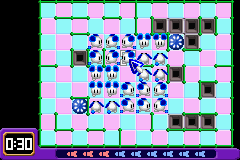 A3 — The ChuChus scatter themselves around the map, but are in no direct danger of falling into the holes. You should be able to get them into the rockets without problem. 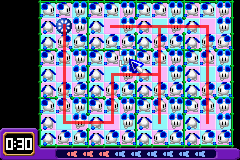 A4 — Place an arrow at the bottom-left corner, then get the ChuChus into the 4-square section in the center. Guide the ChuChus down as you normally would. 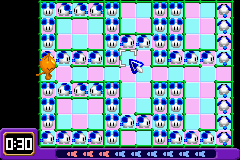 A5 — The most difficult of the Get Mice challenges. If you haven't already, set the control mode to Pro (available in the options) to allow fast one-button drops. The difficulty in this map is reaction and reflexes. There are eight ChuChus circling in the right, and four more which can be retrieved en-route. 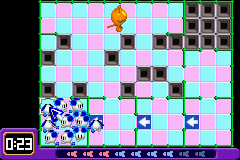 Moving ChuChus down in each column isn't difficult, but moving them up is hard. Place a left arrow just after the exit of a 4x4-square, a right arrow when they need to turn, then an up arrow in the 4x4 to get them moving. 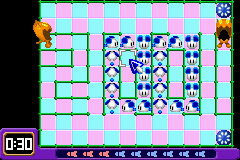 As soon as the ChuChus clear the small room, place an up arrow next to the right arrow to let them continue. B1 — Place up arrows in the path of the ChuChus to get them to the upper rocket. B2 — Get the ChuChus circling around the border into the circular paths of the inner ChuChus. Next, move the KapuKapus to the border, allowing the ChuChus to get a safe path to the exit. 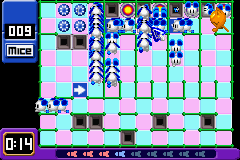 B3 — The bottom-most row contains a hole that can be used to dispose of the KapuKapus. Once they're out of the way, you can guide the ChuChus to the rockets. B4 — Get the ChuChus in the bottom-left corner free first, then trap the KapuKapu in there. 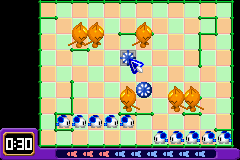 Next, get the ChuChus out of their 4-square cages as quickly as you can drop arrows. B5 — The first threat is the KapuKapus reaching the rockets. Place down arrows in their path, to deflect them behind the ChuChus. 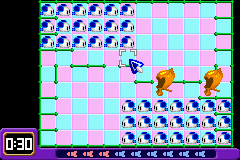 Next, rescue the ChuChus at the top by collecting them into the top-most row and guiding them to the rocket. This is the inversion of the normal rules: you guide all ChuChus into the hungry KapuKapu. C1 — Guide the ChuChus to the center loop. 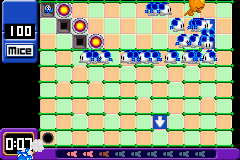 C2 — Either guide the ChuChus to the center, or guide both the KapuKapu and ChuChus to the same loop. C3 — Get the ChuChus out of their letters. 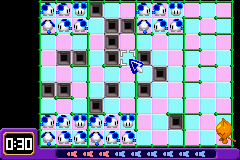 C4 — First, collect all the ChuChus into the bottom-left cell. From there, you can easily fill up the KapuKapu. 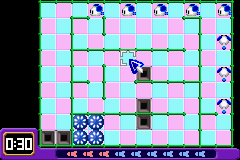 C5 — Of the lunch time challenges, this is the most difficult, as you have to guide the ChuChus and have them evade the pits. 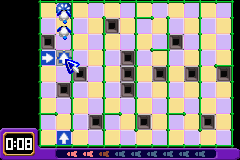 While the path is easily visible, the main difficulty is from the strict time limit and having to perform quick arrow placement. D1 — Fill the rockets from the spawn points that did not create the KapuKapu. D2 — Either trap the KapuKapu in the bottom-left corner, or bounce the KapuKapu along the top area. Use the arrows to guide the ChuChus to the right-hand rockts. D3 — At the top three rows, place down arrows to get the ChuChus into the section below, but place a left arrow in the row containing the KapuKapu. 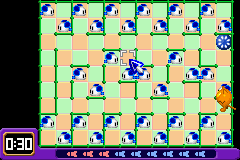 Once the flow of ChuChus stops (because there are 100 ChuChus on screen), place down arrows and guide them to the bottom. D4 — If you can, trap the KapuKapu into the area left of the spawn point. 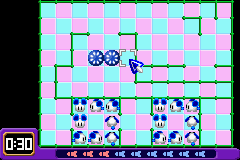 Then, build up the 100 ChuChus required to escape, by guiding through the hole in the right to wrap them to the left-most room. From there, guide the ChuChus to the center corridor, which gives access to the rockets. D5 — If left as is, the ChuChus will simply run into the pits near the spawn point. 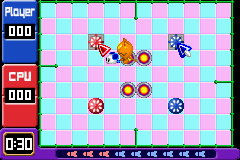 Place three down arrows before the three left-hand entrances, and collect the ChuChus. 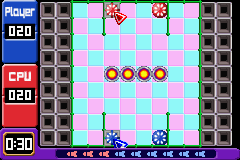 Place a right arrow in the ChuChus's path to collect them into the center, and place arrows to guide them to the exit. While you could attempt to get ChuChus from the right-most entrance, it takes more effort as the ChuChus would otherwise charge into a hole. The objective is to get as many cats into the opponents rockets as possible. 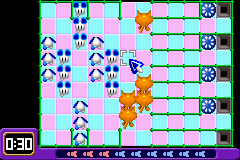 Arrows can only deflect the mutated cats twice; after that, they disappear. 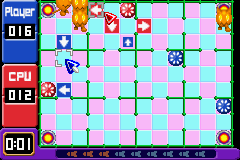 E1 — While the map is simple, the CPU is aggressive on this map and will try to place as many arrows as possible to direct the KapuKapus to your rockets. Simply place as many up arrows as possible, keeping focus at the bottom-right rocket. E3 — The AI places focus on defending only one of its rockets - guide the KapuKapus to the other one. This challenge stage plays just like a versus match - try to get as many ChuChus into your rockets, and make sure your opponents rockets receive the KapuKapus. From time to time, you will see a red mouse with a question mark on top. Rescuing this mouse will create a special event. As with other challenge maps, there is a 30 second time limit. 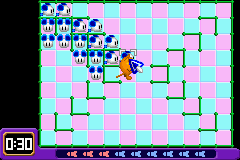 However, you will automatically win if you lead by 100 mice. There is nothing unlocked by completing the challenges. This page was last edited on 30 July 2010, at 19:56.